"It's unashamedly dance music, in a style recognised as typically English - bouncy, measured and infectious - exactly what you'd get an an English rebellion ceilidh; jigs, reels, polkas and hornpipes. The musicianship here is impeccable, with subtle interplay between the melody instruments, as each takes the lead, whilst the cello, horn and piano add depth and rhythm... This is a delightful collection of wonderful dance music from a truly exciting band. I urge you to seek them out live, to dance to as well as to listen to!" Produced at Wild Goose Studios. 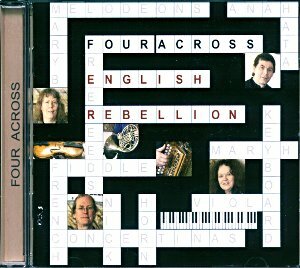 English Rebellion have recorded an album of their music. Four Across features mostly dance music and also two songs. The tunes are a mixture of well known and less familiar traditional material and some of Nick Barber's own compositions.